See examples of fantasy looks. Knowing the answer to "What is fantasy makeup?" can help you make the right decisions the next time you need to create a fantastical look for a special occasion or anytime. While Halloween may be the first occasion that comes to mind when you think of fantasy makeup, it's certainly not the only occasion. Since makeup is supposed to be fun, women should feel free to play around with various color combinations and techniques. Fantasy makeup allows a full range of creativity, whether you wear a subtle fantasy look or you go all out in a detailed display. Just about any holiday or event can be celebrated with fantasy makeup. Valentine's Day may find you with red and pink hearts artfully dotting your face from forehead to chin, while the Fourth of July may inspire you to paint a red, white and blue flag on one cheek. 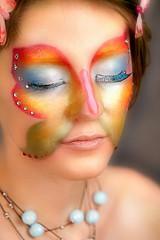 Fantasy makeup is any look designed to help create an experience. It's not about blending in; it's about standing out. Fantasy makeup can help wearers pretend to be anything, whether it's a mermaid, witch, insect, musical instrument or animal. You may also simply paint your face in a freeform fashion as you would a picture -- you don't necessarily need to be a character. These are only a few suggestions. While skillful makeup application can be the basis of a whimsical look, feel free to embellish your face even more with accessories like adhesive rhinestones, temporary tattoos, appliques, metallic accents and even feathers. The sky's the limit when you're going for fantasy. It may seem intimidating to a makeup newbie to imagine turning your face into an artistic masterpiece, but with practice and a creative focus, you may be surprised to see what fantastic looks you can create. While you can use basic cosmetics that you wear on an everyday basis, fantasy makeup doesn't adhere to rules you may already know. Instead of only focusing on your eyes, cheeks and lips, approach your entire face as a blank canvas. Your forehead, chin and nose may also come into play when designing a fantasy face. 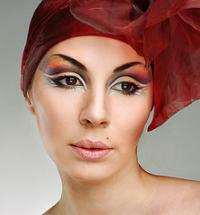 You may need theatrical makeup, face paint and cosmetics designed for long-lasting wear. Smaller brushes will create details better than the wide, sweeping brushes used for applying face powder. Choose vibrant colors that are otherwise too bright to wear to work or school. Fuchsia, gold, silver, neon and glittery metallics are all perfect for creating fantasy looks. While face painting is popular for children at fairs and parties, grown-ups can also enjoy pretending to be someone -- or something -- else. "What is fantasy makeup?" has different answers, depending on how little or how much you want to transform. By complementing your makeup with hairstyle and clothing, you can turn yourself into just about anything.